Urban Initiatives – Recess at (Not Quite) 20 below? Recess at (Not Quite) 20 below? Students at Gunsaulus Scholastic Academy are enjoying this unusually snowy winter by making time to throw plenty of snowballs! Recess in Chicago Public Schools has only recently been reinstated for every student, and Urban Initiatives has partnered with 15 schools to help make the most of that time for fun, physical activity, and learning. During nice weather, you will see students at recess playing soccer, throwing long football passes, sitting on the swings, or chasing each other around the playground equipment. 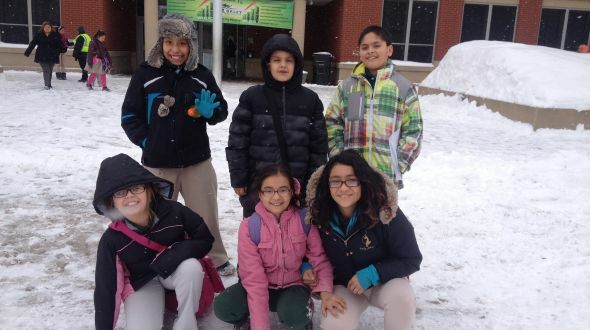 During snowy weather, most schools prefer to keep students indoors for safety and convenience. However, the recess team at Gunsaulus has been working hard to make sure that students spend time out in the snow, taking a lesson from our friends in Alaska, who wrote Recess at 20 Below. Here are the top 3 reasons why students at Gunsaulus like to go outside for recess. 1. We learn how to have a proper snowball fight! Students practice social emotional skills when they play games with their peers. They learn how to solve problems and work together to come up with informal rules and set boundaries (i.e. : don’t throw snow at people’s faces, don’t throw snow at people who don’t want to play the game). 2. The open field is in great shape for play! The field space at Gunsaulus is often muddy or hard; if you fall on it you’ll get dirty. When it’s covered with snow, you can still play sports and if you fall, you can just brush off the snow! 3. It is so nice to go outside! Students are inside all day, hard at work in school. Recess is supposed to be a time to take a break. A breath of fresh air feels good even if it’s cold. Plus, once you get playing a game of soccer, you’d be surprised how you can still work up a sweat in 25 degree weather. We definitely have to agree. Thanks to everyone at Gunsaulus who makes this recess possible, no matter the weather!